Today's photo features half of the Brewers' infield in the mid- to late-1930s. Lin Storti, on the right, was a reliable infielder for the Brewers from 1934 through 1938, starting out at second before finding a regular home at third base. He also played for the St. Louis Browns, who owned by the Brewers at the time he came to Milwaukee. His partner in the infield, Eddie Hope, was primarily a second baseman. Hope was of Polish descent (his family name had been changed a few generations back from "Nadzieja", Polish for "hope") and as such was popular among the Poles on Milwaukee's South Side. Hope came to the Brewers with a reputation for a strong bat and soft glove. Within his first few seasons, the Brews found that inverted; his fielding improved dramatically—Hope was instrumental in the Brewers turning three triple plays during the 1934 season—but his work at the plate struggled, and for years he was widely known as the weakest hitter in the Brews' lineup. He was called a "banjo hitter," as the balls he did hit were mostly looping flies just out of the infield. The club went to some unorthodox lengths to improve Hope's hitting—including trying to convert him from a right-handed batter into a lefty—with little success. 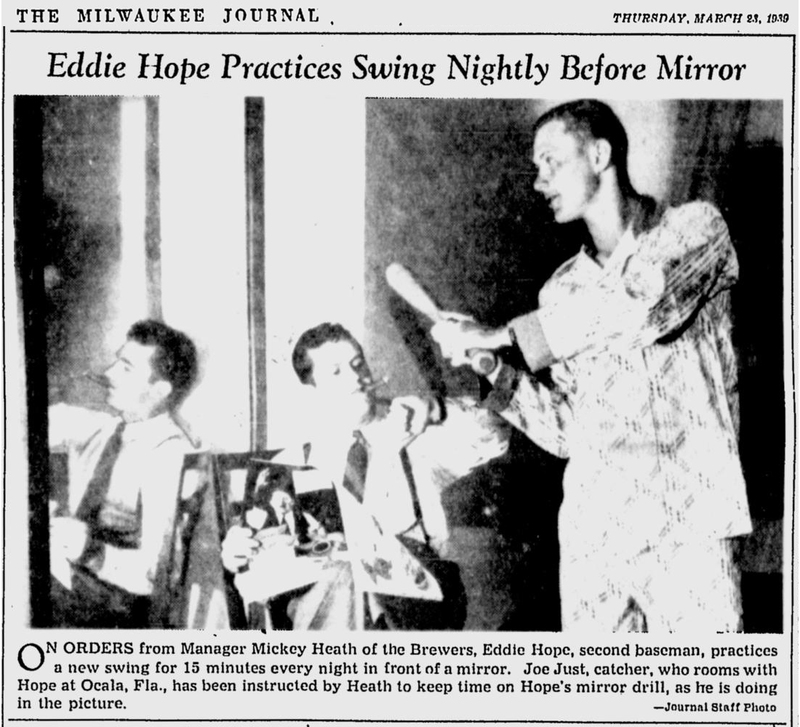 On orders from Manager Mickey Heath, Eddie Hope, second baseman, practices a new swing for 15 minutes every night in front of a mirror. 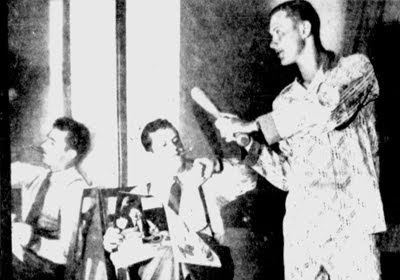 Joe Just, catcher, who rooms with Hope at Oscala, Fla., has been instructed by Heath to keep time on Hope's mirror drill, as he is doing in the picture. This "mirror drill" didn't work, the Brewers' patience finally ran out, and Hope was released just weeks later. He signed with the Brooklyn Dodgers' farm in Elmira, New York. After a couple years kicking around the lower minor leagues, Hope retired from baseball in 1942 and returned to Milwaukee, where he joined the police force. Although this photo is undated, I believe it to have been taken in 1937 or 1938. Lin Storti's presence puts it no later that that, but no earlier than 1934. The uniform style allows us to narrow it down. 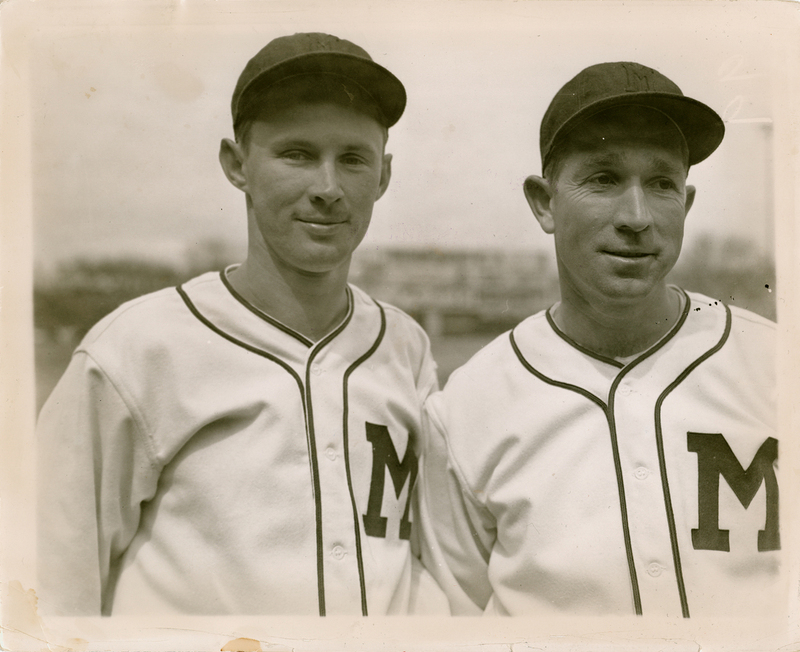 The 1935 uniforms had a fancier "M". 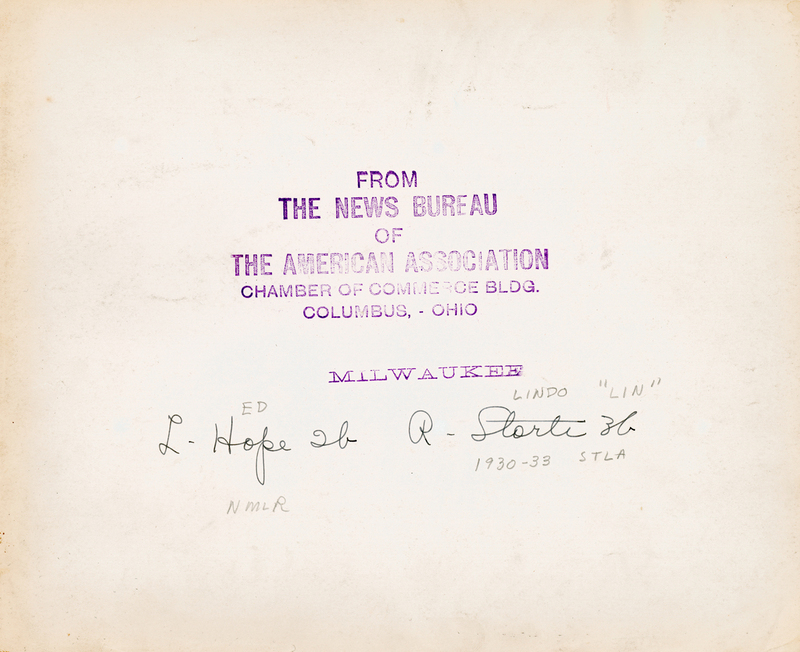 In 1936, the Brewers' uniforms had red and blue piping, not the single-color soutache shown here. Those caps are nice - hard to make it out exactly, but looks like a red serifed block "M" on a navy cap. 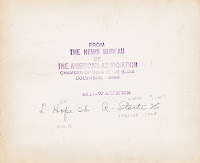 Check out the serif-heavy typeface on "MILWAUKEE". Very cool. Love this photo of Hope and Storti. It will be interesting to see how the defensive stats pan out to see if they were a leading double-play combo.